With contestants from Maine to California and a ten-thousand-dollar prize at stake, Sherry’s latest competition, hosted by the CEO of an organic food company, is sure to be heated. But she’s more than ready to step up to the stove. After all, she did win the award for Most Creative Cupcake back in high-school.Today, she’s hoping her flavorful pork tenderloin will sway the judges. Instead, it seems someone’s decided to slay one of the judges . . . Expiration Date by Devon Delaney is the premier novel in A Cook-Off Mystery series. Sherry Frazzelle (rhyme with la belly) is one of the finalists in the OrgaNicks Cook-Off in Augustin, Connecticut. The grand prize is $10,000 and title of OrgaNicks Supreme Home Chef. The judging is completed, and Chef Tony Birns is announcing the winner when he collapses. After it is determined he was poisoned, Sherry rises to the top of the suspect list since her dish was the last one sampled by the victim. Sherry with help from fellow competitor, Amber Sherman sets out to clear her name and her pork tenderloin. The killer, though, is less than thrilled with Sherry’s sleuthing and attempts to warn her off the case. Sherry is missing the last pieces of the puzzle that will help her identify the guilty party. She just needs to assemble the clues like the ingredients in a recipe and stir until she cooks up the killer. Sherry will need to be careful or she will get burned. 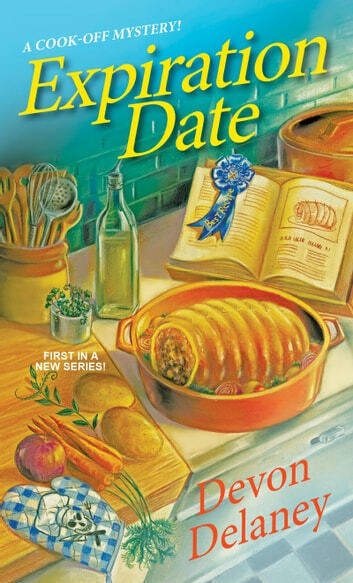 Expiration Date is a light, humorous cozy mystery. I felt that Expiration Date could have done with some rewriting to give it a better flow along with a more solid mystery. The pacing slowed down considerably when food was being cooked and described. When Sherry was cooking, the book was reminiscent of a cookbook instead of a work of fiction. We are told each ingredient along with every step in the cooking process. The dialogue could have used some tweaking. It was awkward. Sherry is not a likeable main character. She is a neat freak, likes to be in control, gets anxious quickly, has panic attacks, scares easily and she expects situations to turn out badly (she comes across as neurotic instead of realistic). Sherry does not like her name to be pronounced incorrectly and corrects people throughout the book. She also cannot stand being called ma’am (this happens throughout the book as well). A contradiction to her neat fetish is one of the guest rooms is filled with her estranged husband’s clothing (looks like the inside of a men’s clothing boutique). Sherry is waiting for him to pick them up. Personally, I would have given the man an ultimatum (I believe he is looking for an excuse to stop by). My favorite part of Expiration Date was barely touched on. Sherry’s father owns Oliveri’s Ruggery, a hooked rug shop (rug hooking is a wonderful art form). I dearly wish the author had centered the book around the shop instead of food competitions (that would have been unique). The mystery was simple and solving it is a cinch (might as well be a giant neon arrow pointing to the killer). The author gives away the who and why early in the story. The case details are repeated (more repetition) and there is a lack of action (more cooking than crime solving). I did find the method of murder to be unique and clever. I was left with one question at the end of the book—who won the cooking competition? I am hoping the author ups her game in the next A Cook-Off Mystery.